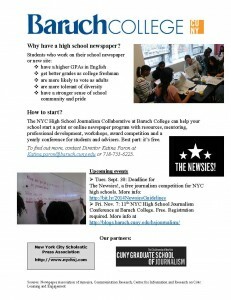 Download this flier to find out how the NYC High School Journalism can help your school. 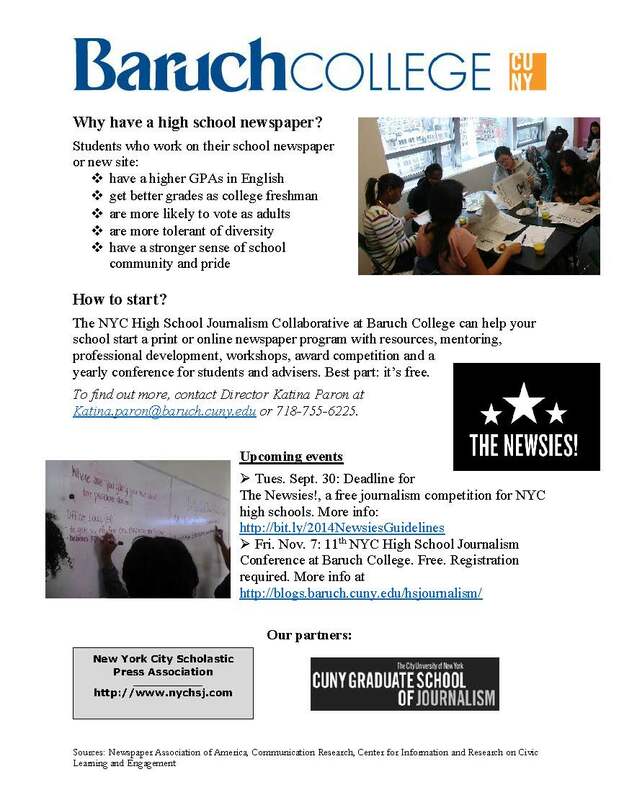 The NYC High School Journalism Collaborative is an initiative to support high school journalism throughout the city. Since 2009, we have served nearly 1,800 NYC teens and 188 advisers from 213 high schools through a yearly conference, award competition and professional workshops for teachers and students. The Collaborative is part of Baruch College’s Department of Journalism and the Writing Professions. If you are interested in getting involved or starting your own school newspaper, please contact Professor Geanne Belton at geanne.belton@baruch.cuny.edu or Glenda Hydler at glenda.hydler@baruch.cuny.edu.